When a timid dinosaur meets a cheeky man cub, the most ridiculous friendship in all Dinosaurdom comes to life! Prehistory has never been so much fun! Rottotom is a mischievous, club-swinging man cub who always gets into trouble and spreads lice wherever he goes. Moomu is a dorky dinosaur who’s terribly wellbehaved and spends his time studying graffi tos and being brainy. Together they live exciting adventures, braving glaciers, earthquakes, and meteor showers! 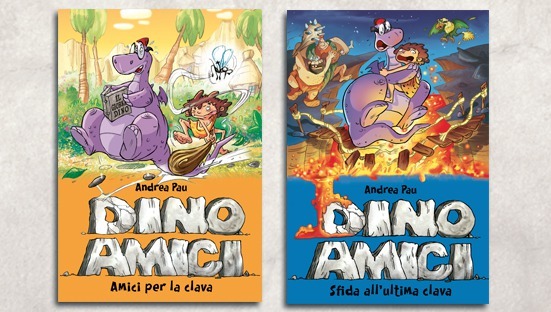 Adventure and laughs in a prehistoric world full of fun, with playful coloured illustrations, highly appealing to little readers. Rights sold in Spanish, Catalan, Serbian and Turkish, Semplified Chinese and Portuguese.